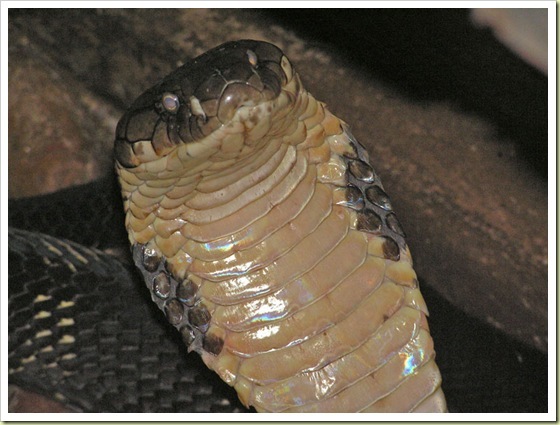 The King Cobra (Ophiophagus hannah) is the worlds longest venomous snake – growing up to 5.6 m (18.5 ft) in length. Ophiophagus, literally means snake-eater as it eats other snakes. One single bite of this deadly snake can easily kill a human. This snake is even capable of killing a full-grown Asian Elephant within 3 hours if the larger animal is bitten in a vulnerable area such as the trunk. Its venom is not as toxic as other venomous snakes, but King Cobra is capable of injecting 5 times more venom than black mamba and can result in mortality up to 5 times faster than that of the black mamba. 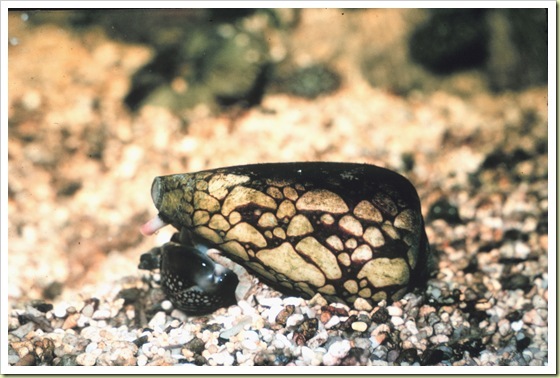 It is quite widespread, ranging across South and South-east Asia, living in dense highland forests. 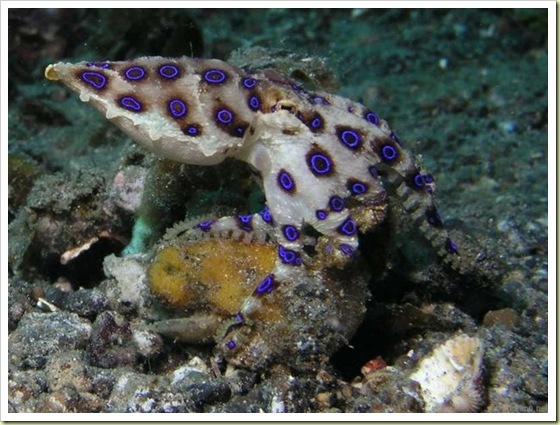 The Blue-Ringed Octopus is very small, only the size of a golf ball, but its venom is so powerful that can kill a human. Actually it carries enough poison to kill 26 adult humans within minutes, and there is no antidote. 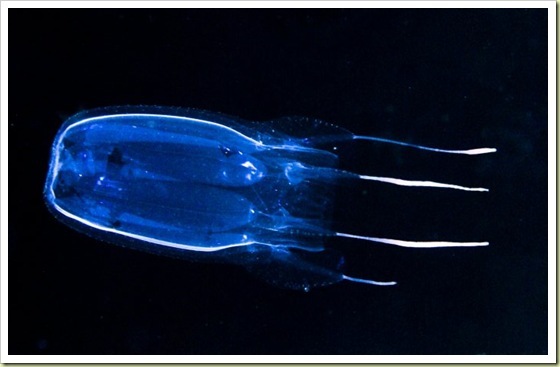 They are currently recognized as one of the worlds most venomous animals. 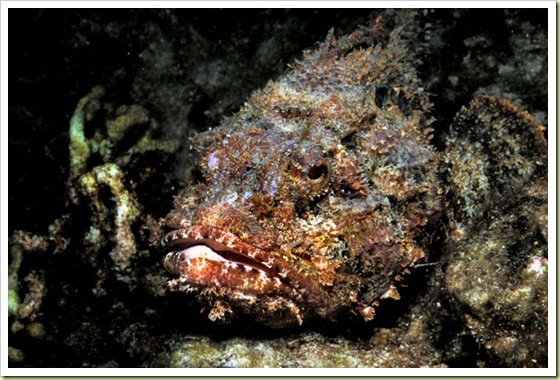 Maybe Stonefish would never win a beauty contest, but it would definitely win the top prize for being The World Most Venomous Fish. 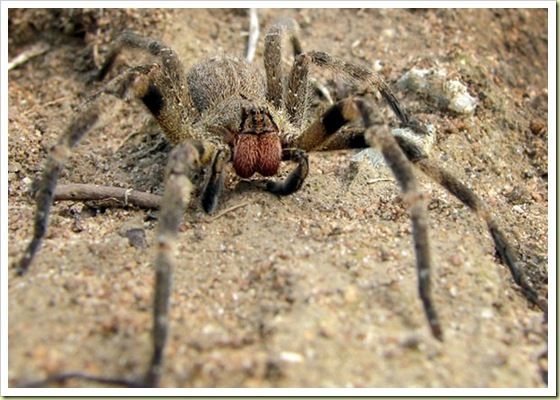 Its venom causes such a severe pain that the victims of its sting want the affected limb to be amputated. It is described as the worst pain known to man. It is accompanied with possible shock, paralysis, and tissue death. If not given medical attention within a couple of hours It can be fatal to humans. 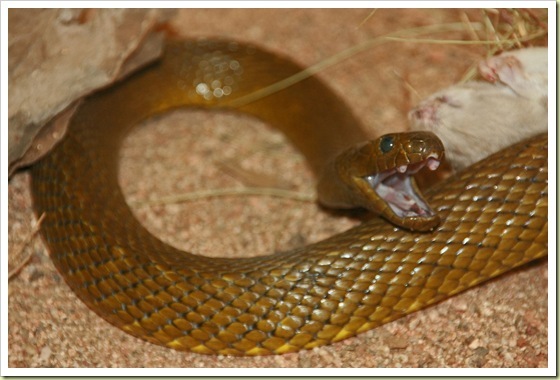 The prize for The Worlds Most Venomous Snake goes to the Inland Taipan of Australia. Just a single bite from this snake contains enough venom to kill 100 human adults or an army of 250,000 mice. Its venom is at least 200 – 400 times more toxic than a common cobra. 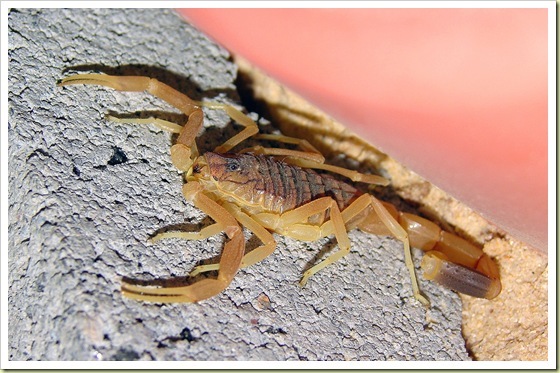 The Inland Taiwans extremely neurotoxic venom can kill an adult human in as little as 45 minutes. Fortunately this snake is very shy and there have been no documented human fatalities (all known bites were treated with antivenin). If you ever happen to be running through the rain forests somewhere in Central or South America, do not ever pick up beautiful and colorful frogs – it can be the Poison Dart Frog. This frog is probably the most poisonous animal on earth.The 2 inch long (5cm) golden poison dart frog has enough venom to kill 10 adult humans or 20,000 mice. Only 2 micrograms of this lethal toxin (the amount that fits on the head of a pin) is capable of killing a human or other large mammal. They are called dart frogs because indigenous Amerindians use of their toxic secretions to poison the tips of their blow-darts.. 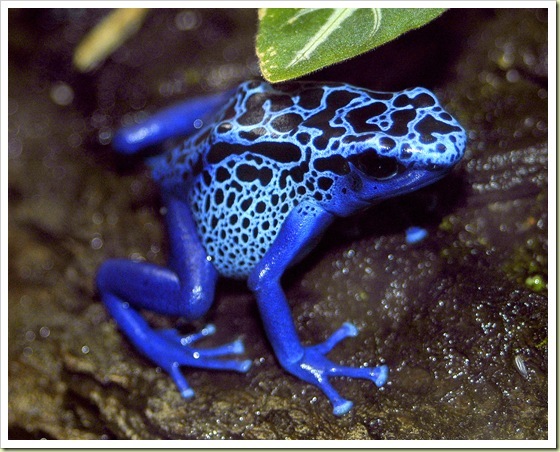 Poison dart frogs keep their poison in their skins and will sicken or kill anybody who touches or eats it. 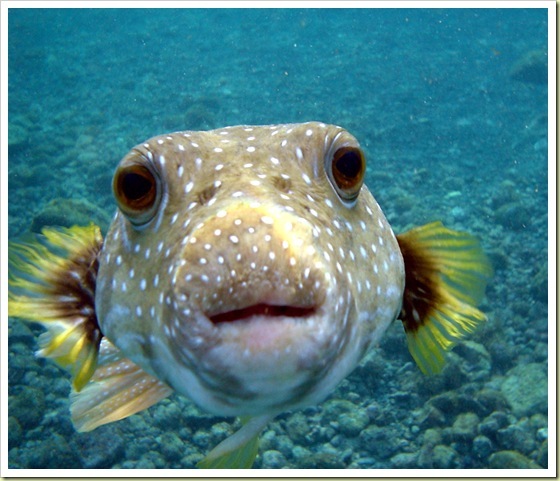 This puffy fish produce rapid and violent death..Puffers poisoning causes deadening of the tongue and lips, dizziness, vomiting, rapid heart rate, difficulty breathing, and muscle paralysis. Victims die from suffocation as diaphragm muscles are paralyzed. Most of the victims die after four to 24 hours. There is no known antidote, Most deaths from fugu happen when untrained people catch and prepare the fish. Statistics show that there were 20 to 44 incidents of fugu poisoning per year between 1996 and 2006 in all of Japan and up to six incidents per year led to death. Since Fugus poison can cause near instantaneous death, only licensed chefs are allowed to prepare it.